This "Historically Speaking" column appeared in the Exeter News-Letter on Friday, December 6, 2013. “Under the direction of Mr Edward R. Scott, the Exeter Players will stage their first play in the Town Hall on Friday and Saturday evenings, October 28 and 29, at 8 o’clock,” announced the Exeter News-Letter in 1938. Thus began the 58 year run of the Exeter Players – the town’s lauded community theater group. The first play performed was “The Late Christopher Bean”, an American adaptation of a French play called, “Prenez-garde a la Peinture,” which had a very favorable run in the early 1930s in both New York and London. 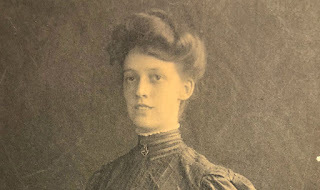 In May of that year, a group of Phillips Exeter Academy faculty and spouses had banded together under Scott’s direction to form the social and dramatic arts group. 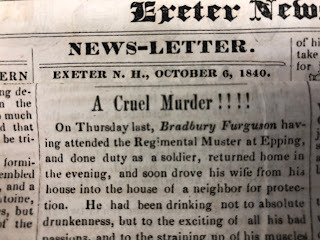 With all proceeds going to the American Red Cross, the production proved to be just the thing Exeter needed that fall. The year had begun with the excitement of the town’s Tercentenary celebrations but the enthusiasm came to a crashing halt in September when the hurricane of ’38 crashed through town destroying most of the elegant trees in the downtown. A witty play about a New England doctor’s family discovering that a collection of seemingly worthless paintings left in the attic were, in fact, quite valuable was just the thing to brighten storm-dampened spirits. Although the group was founded by Phillips Exeter Academy staff, participation was not closed to the public. Indeed, the first mention of the group in the News-Letter, encouraged, “it is hoped that as interest in the venture grows, other townspeople will be encouraged to join, so that what has begun in a small way may become something of a community venture.” The notice proved to be prophetic as the group grew in size quite quickly. Productions increased from two per year to four or five. Activity with the group demanded total commitment. Actors helped build sets and all members attended monthly meetings to help pick new material. Theatrical talent, or lack of talent, was not a requirement for these casual thesbians. And yet, there were some very talented people who participated in the Exeter Players. One of the greatest pleasures of attending community theater is the surprise that comes when one discovers that one’s dentist or realtor or cafeteria lady can transform on stage. It’s like having Superman living in the apartment next door. Who knew, right? Beginning in the 1970s, the Players stored sets and props in the Fieldsends family barn in Newfields, but eventually it became too expensive to heat the old place and the group began renting the second floor of the Exeter Town Hall. For the next 20 years, until the Exeter Players folded in 1996, the Town Hall was home. The players chose comedies, dramas and musicals. In the group’s early days, plays were frequently chosen based on how many set changes were required – the fewer the better. Musicals were usually the most popular and tended to draw more sponsors. Like most small organizations, funding was often very tight. Proceeds from the shows typically went to charities, but donors were recruited from the entire community. Small grants could be obtained from the New Hampshire Commission for the Arts. But to say they ran on a shoestring budget would be an understatement. Only in the movies could Andy Hardy raise a small fortune by putting on a show. Locally, it was more typical to simply break even. In 1965, the Exeter Players had a bit of competition from the Exeter Minstrels – a group that staged variety style shows. The two groups seemed to coexist well and there didn’t seem to be a drain of talent. By the 1990s it was becoming harder and harder to find enough people willing to participate in local theater. 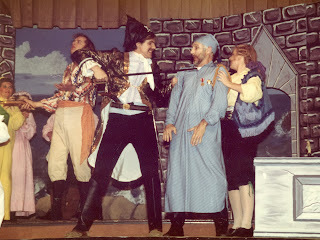 In 1996, the Exeter Players donated their records to the Exeter Historical Society and the massive collection of sets, costumes and props went to the Exeter High School drama department. The Town Hall still retains an excellent stage and can serve as a venue for performances of all kinds. Perhaps it’s time to rekindle the excitement and find out if Superman does indeed live on your street. Photo: The Exeter Players stage a scene from “The Pirates of Penzance” in November of 1981 at the Exeter Town Hall. Musicals were very popular with the local audience, this production was directed by Robert True, musical direction by Andrew Inzenga and choreographed by Hazel Lunardo. Seen here, the Pirate King (Jefferson Wells) threatens Major-General Stanley (Richard Brown).